Full house with Rowell Ranch Rodeo & Hayward Rotary Visit! THOUGHT(s) FOR THE DAY - from Bruce Johnson: Cowboys are gentlemen who treat women with respect and work hard. They us their manners more than any man in the world and ride horses and bulls like there is no tomorrow (Author unknown). SINGING WITH CETA - We crooned “Home, Home on the Range!” under the direction of our Little Cowgirl Songstress. VISITORS - Lots of Hayward Rotarians and some students from the English Language program at CSU East Bay! SAL TEDESCO MEMORIAL HELLO SONG - Dan Willits was magnificent and made sure everyone knew the words, too! 2014 Chili Cook-off Chair Kern Lewis reported that the event was a tremendous success with 18 entries . . . the Chicken Drop Bingo was great, too, netting mroe than $300 for Polio Plus . . . the Chili Cook-off should net around $7000 for our Club projects . . . see the May 14, 2014 CV Forum for more coverage . . .
Co-Parade Chair TL Bailey reported that the 2014 Rowell Ranch Rodeo Parade was a tremendous success due to everyone pulling together . . . with more than 85 entries, everyone had a great time . . . special thanks to Hafsa for her patience and dedication to staying where she was assigned (she has not been seen since Saturday when she was put there) and Jim Negri for handling the parking lot and horses . . . pictures will be posted soon as will the video done and produced by Ron Lapum of Redwood Christian Schools . . . see the May 14, 2014 CV Forum for more coverage . . .
MAY 14 - ROTARY U AT THE DOUBLE TREE - TONIGHT IS THE NIGHT . . . 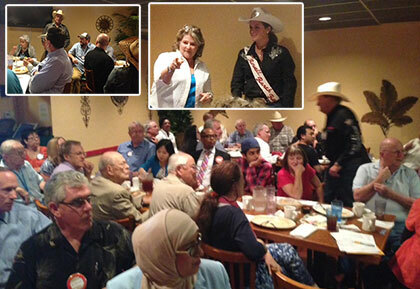 PROGRAM - Today was Rowell Ranch Rodeo Committee/Rowell Ranch Rodeo Joint Meeting with Rotary Club of Hayward with Janet Lemmons and Russ Fields making sure everyone understood “Rodeo” they best they could teach us in thirty minutes PLUS the 2014 Rowell Ranch Rodeo Queen, Gianna Armanino, was present to personally invite everyone to the multiple events this coming week. If you were not at the meeting and missed the video, you really missed something! Watching those teams of cowboys try to catch and milk a wild cow would win big money on America’s Funniest Home Video! Click here for more information on the 2014 Rowell Ranch Rodeo beginning later this week: http://rowellranchrodeo.com/index.html . . . LOOKING FOR THE WHITE MARBLE - With $125 and 5 marbles, 2014 Rowell Ranch Rodeo Queen, Gianna Armanino, reached into the sack and won . . . $125!